For some, plastic surgery is a way to regain a normal appearance after an accident. For others, plastic surgery is a way to correct perceived cosmetic flaws. Regardless of the reason for the plastic surgery, there are serious disadvantages of the procedures that must be considered prior to having surgery. 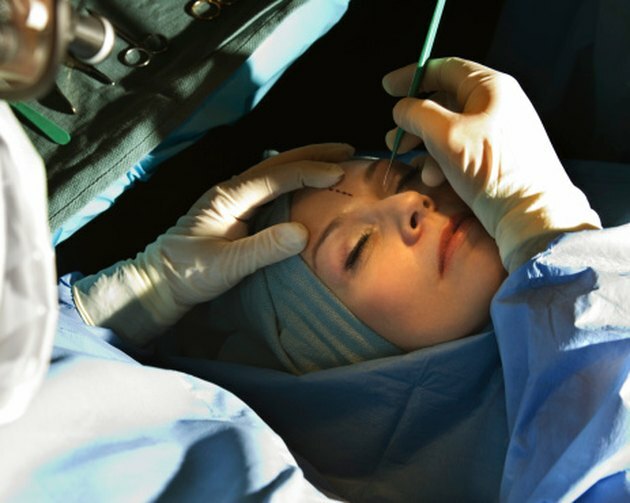 Plastic surgery, like any surgery, carries a risk of medical complications, including death. Some of the most common risks associated with plastic surgery are infection, severe bleeding, nerve damage that may lead to numbness, tissue death (necrosis), fluid collecting around the site (seroma) and bruising in the area (hematoma). Blood clots and deep vein thrombosis are also possible complications of plastic surgery. Unsightly scarring is a possible disadvantage of plastic surgery. These scars, which are called hypertrophic scars, are thick and red. They usually don't fade like most surgical scarring. Bruising and swelling for a period of time after the surgery are often difficult to hide, especially when the work was done in the facial area. Ptosis, or drooping and sagging in the surgical area, are also possible disadvantages. Additionally, some patients find the results of the procedure aren't what they expected. Many plastic surgery procedures are costly. According to the American Society for Aesthetic Plastic Surgery, as of 2008, microdermabrasion was the least expensive procedure. It costs an average of $139 per procedure. With a cost of $7,976, a lower body lift was the most expensive plastic surgery procedure listed. These costs are only the base cost of the procedure. Surgeon fees, hospital fees and anesthesia fees, along with lost wages, medication costs and after care costs must also be factored in when considering the cost of plastic surgery. Some people become addicted to plastic surgery. Ease of access to plastic surgeons, low self esteem and body dysmorphic disorder are some of the factors that contribute to an addiction to plastic surgery. A person who is addicted to plastic surgery is often willing to have any perceived flaw in his appearance corrected by a surgeon at a moment's notice, even if it means taking money from other areas, such as rent or utility payments. What Are the Pros & Cons of Cosmetic Surgery?